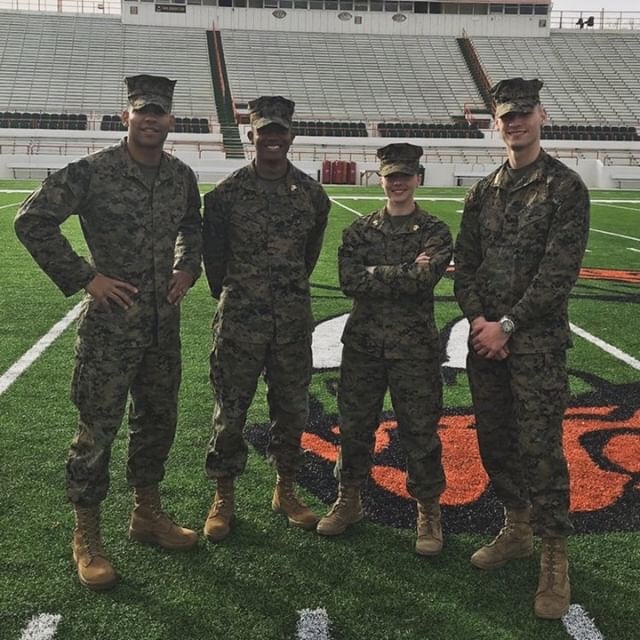 For a number of students on Florida A&M University’s Reserve Officers’ Training Corps (ROTC) program, serving and protecting has always been a dream for them. Pictured (L-R) Zachery Allen, Javier Benabe, Morgan James, Jackson Foster. Photo Courtesy of Morgan James. For a number of students in Florida A&M University’s Reserve Officers’ Training Corps (ROTC) program, serving and protecting has always been a dream for them. Though each student’s journey to the program is different, many can still recall the moment they made the decision to join. Javier Benabe, Marine Option Battalion Senior Enlisted Advisor, was intrigued by his career as a child. Through FAMU’S ROTC program, Benabe and others like him have been able to pursue both their dreams and a higher education. “I saw the Marine Corps commercial growing up as a kid and thought ‘Man that looks really cool,’” Benabe said. Individuals can enlist in the military right after high school but, those that pursue a college degree will graduate as commissioned officers, granting them more of a leadership role. Morgan James is not only a Marine Option Midshipmen but also a Company Commander and Color Guard Commander. James explained how the classes teach skills that can be used in and out of the program. “A lot of our classes are leadership oriented to help develop our mindset to already be in that leadership role,” James said. While in the program, students can have any major, but are required to have a minor in Naval Science. Their major field of study does not necessarily have to correlate to their path in the Marine Corp, but it can help them advance. Jackson Foster, Marine Option Battalion Commanding Officer, explained how students could use their interests and goals to decide what to pursue in the program. For Marine Options like Benabe and Foster, graduating comes with a little more stress than normal college students would have. Not only do they have to pass their classes and a fitness test, they also have to attend Officer Candidate School. Marine Options must attend Officer Candidate School the summer before their senior year. It is a six-week process of evaluation by the Marine Corp. Typically, students may have academic tests going on at the same time as leadership evaluations, which can add more stress. Foster jokingly admitted to it being difficult at times balancing student life, a social life, jobs and ROTC. From Monday to Friday, students are required to meet at 5:45 am for Physical Training. For these ROTC students, these rigorous courses have also helped to establish lifelong friendships. Zachary Allen, Marine Option Midshipman and Company Commander noted the rigor of PT is what helps build a connection and closeness for students within the program. While the program is very demanding, the students love being apart if it, agreeing that they have grown tremendously since first entering the program and have been taught honor, discipline and time management.